This seven-day seminar held in the peaceful setting of a Mahayana Buddhist monastery in Ukiah, California—the City of Ten Thousand Buddhas, will introduce participants to early Buddhist literature. DRBU Symposium team and CARE: Compassion for Animals, Respect for the Earth are proud to announce a free public screening of the highly-acclaimed documentary, Unlocking the Cage. 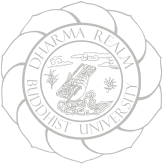 Dharma Realm Buddhist University and the Buddhist Text Translation Society are delighted to announce a new publication by Dharma Realm Buddhist University’s Chancellor Emeritus, Dr. Ron Epstein, Ph.D. Responsible Living: Explorations in Applied Buddhist Ethics - Animals, Environment, GMOs, Digital Media is a collection of exploratory essays which uses applied Buddhist ethics, with support from passages in classic Buddhist texts, to address a host of modern day issues related to the environment, animal rights, and digital media. We are please to announce the first Awakin Circle at DRBU with our dear friends from Service Space. During the circle time, two musicians Nimo and Fab will be sharing their music and reflection with us. Venerable Bhikkhu Bodhi will offer two lectures: "Planting Wholesome Roots" and "Practical Dependent Origination." The First Annual DRBU Student Symposium will take place on Sunday, February 25. This lecture is an invitation to take a stroll through Heidegger's field that leads to thinking and closely follow the invisible marks that he may have left behind in his late years. This talk will be on spiritual friendship and harmonious living with regard to cultivating qualities that contribute to a healthy community. Through a careful textual study, this lecture explores evidence for the close relationship between the Kāṇva brāhmaṇas and early Buddhists in Kosala.